Topic: Dungeness - remains of gun emplacement? Re: Dungeness - remains of gun emplacement? Thank you for the response. Very interesting. So it does look like spoil that was transported there. I just checked the Defence of Britain data base and there's nothing showing in that area although there is a lot further inland. At the head of the long pond in Dungeness is a pile of concrete remains. See attached photographs. The location is just by where the road towards the power station forks to the right off Dungeness Road. I had thought that (because of the lookout slit and the fact that much of the concrete is reinforced) the dumped concrete was the remains of one or more pill boxes. However, see an interesting conversation re this on the Facebook page 'Dungeness Then and Now'. It has been reliably suggested that the concrete isn't thick enough to be from a pill box, and that instead it's more likely to be from a larger gun emplacement, and that possibly the rubble could have been brought by rail from elsewhere. In which case can anybody shed any light? 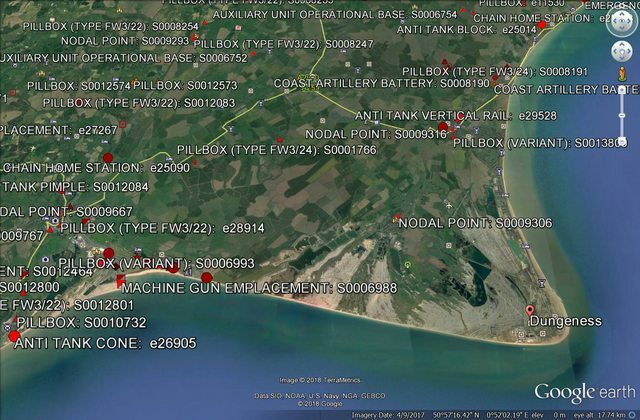 From my War Department defences map of Dungeness, the 6lb anti-aircraft gun emplacements don't look to be reinforced, neither do I see any pill boxes on the map.